The latest greatest NUMSys is here. I’m really excited about this version, it took me a while to think about all the reports and of course to implement it. This is the release which saw a bunch of updates. All the tables now allows you to perform multiple selections. As you can see there is a Reports tab in NUMSys. You can create a bunch of reports for documentation purpose. 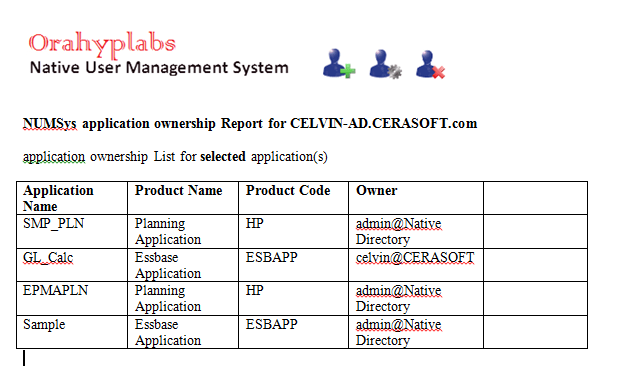 Provisioning report can generate an inheritance report along with user/group role. It can plot upto 5 levels. Using this you can see which user is the owner of the application. Extremely useful in case of Essbase and Planning applications. 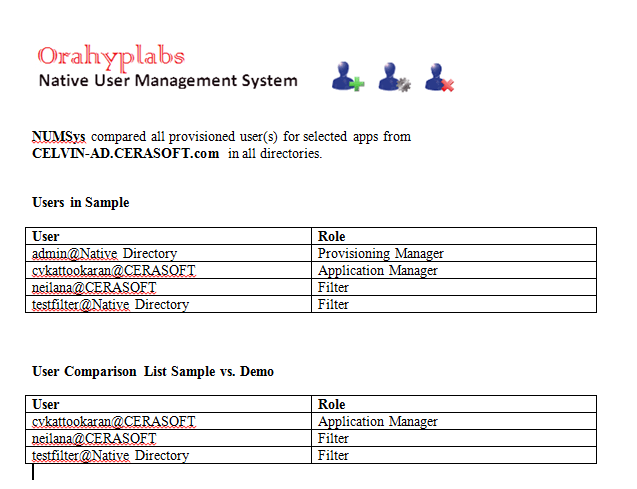 This will generate two reports (app1 vs app2 and app2 vs app1) with the users in the application and the difference. 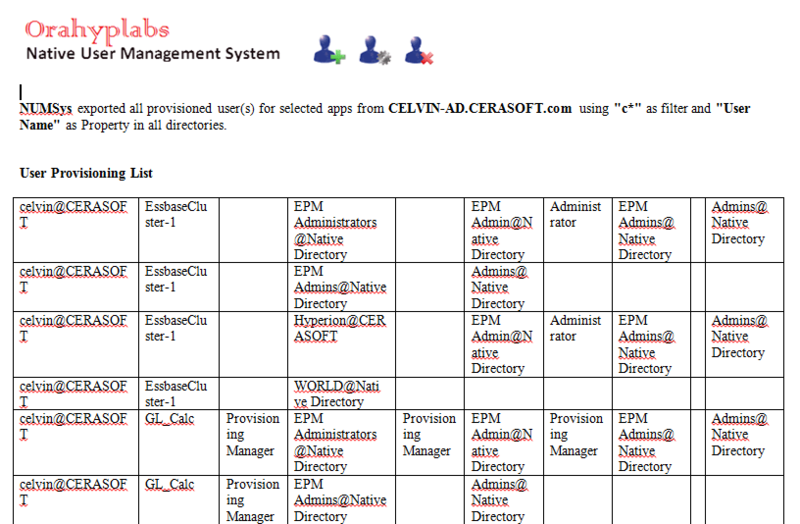 This is similar to provisioning report, this will plot the user/group’s ancestral tree to 5 levels. 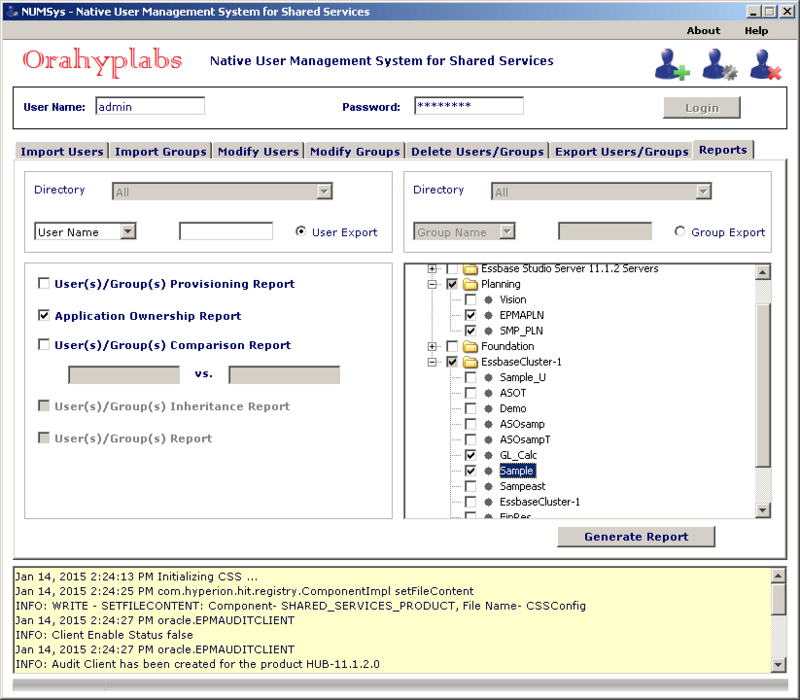 This is the old documentation report which can report on all users/groups in all directories. You can download NUMSys 3.0 from here. It doesn't seem to work. I update the cmd file with the path to java_home and epm_oracle_home. Select login, but it doesn't connect to shared services. SEVERE: An error occured when checking the status of the registry connection and reseting it. I can connect to shared services just fine. Any suggestions? This is being run on the foundation server. I was able to connect, but when I pull users from HSS I get the following error: Any suggestions please? SEVERE: Failed to get users. Principal is null. 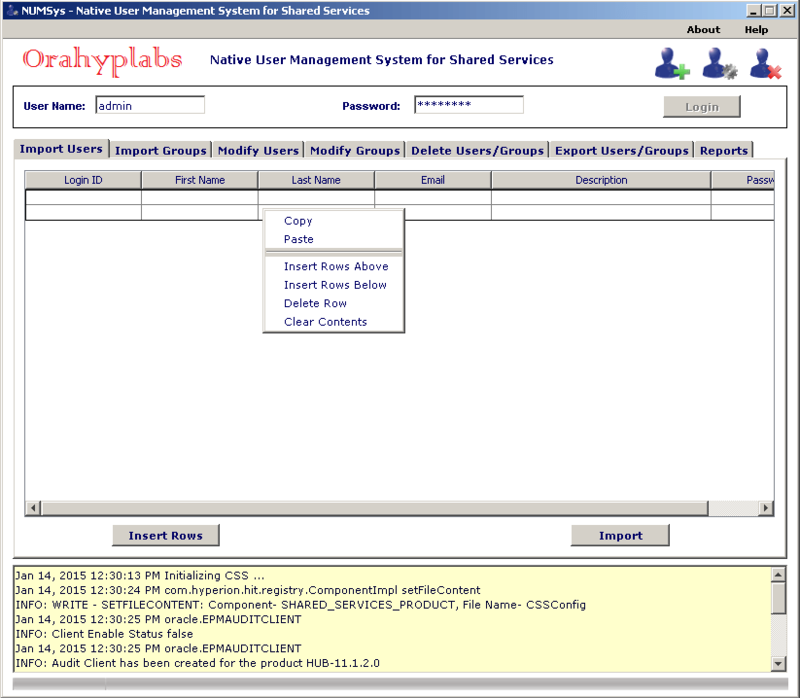 Provide valid user principal to access. EPMCSS-00728: Failed to get users. Principal is null. 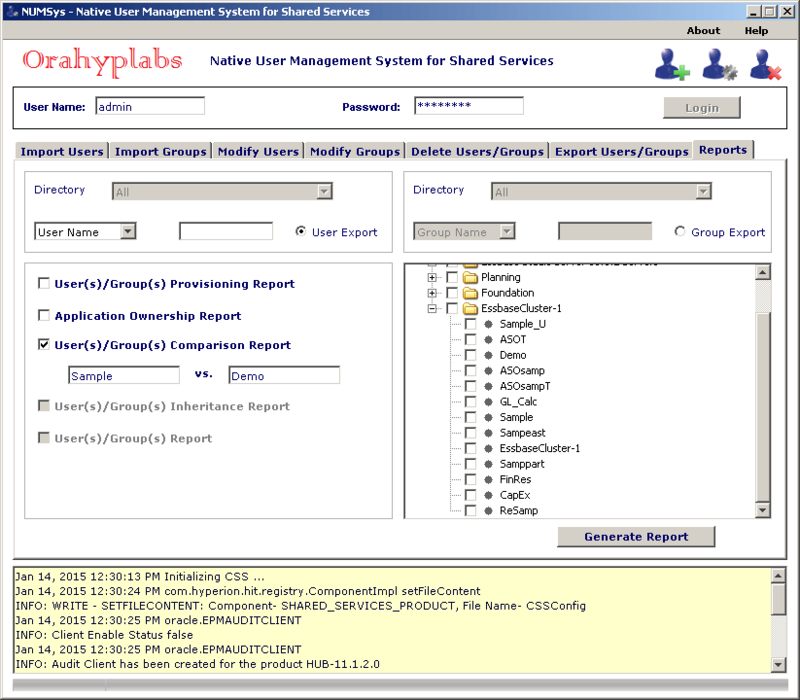 Provide valid user principal to access. It should be a valid HSS administrator. For some reason these are the error messages i am receiving when logging into the tool. I have set the variables as needed. INFO: The file reg.properties could not be found. INFO: Security Key could not be read from reg.properties file. INFO: Initializing the credential store for Registry. INFO: The JPS Config File is null. It says the reg.properties cannot be found, did you update ORACLE_INSTANCE variable in the bat file? Yes i did update the Oracle_Instance variable in the bat file . I must mention that the values of the Path variables are referring to a mapped drive, is that causing some trouble? I cannot get this release to work with 11.1.2.4 on Oracle 12c. Should this be compatible? Future release? I've not tested this with 12c specifically. However what is the error that you are getting. Send me the details and I can look at it. I didn't publish your comment as it has the server and user name in it. Questions – Do you have any applications in this one? Seems like the tool is failing when it is trying to query for applications.